It’s with great pride that Roadmaster Booking announces the upcoming tour of the German funeral doom entity WORSHIP. The tour will be in support of their 4th Album ‘Dusk of Legion, Morning of One’, and will also count with the Mexican doomers of MAJESTIC DOWNFALL. The Doommonger, guitarist and vocalist of Worship, says: “Our new album ‘Dusk of Legion, Morning of One’ is currently moments before being launched, and it is an album that was heavily inspired by the best moments we had on stage on our last 2 tours. To take this new material on tour seems like going full circle, and we looking forward to the results! For the first time, we will play a song or two from our new album ‘Dusk of Legion, Morning of One’. But, we will also include many hits from 19 years of WORSHIP, of course! We love to be on tour, WORSHIP works really well on stage. We get a lot of good reactions from the audience, and so we are keen on spreading the virus once more”. +WORSHIP (Ger/Weird Truth Productions) – One of the worldwide best known Funeral Doom bands , Worship was founded in late 90’s by ‘Fucked Up Mad’ Max Varnier from France and Daniel ‘The Doommonger’ from Germany. After the tragic suicide of Max, the band was on ice between 2001 and 2003, when The Doommonger decided that Worship should go on. With diverse tours around the globe, 3 Albums and splits with bands like Mournful Congregation and Loss, Worship is about to release it’s 4th Album ‘Dusk of Legion, Morning of One’. +MAJESTIC DOWNFALL (Mex/Pulverised Records) – After 4 full lengths and 2 split albums, Latin America´s leading Death/Doom Metal band will finally depress Europe. Expect crushing riffs, melancholic passages and full on chaotic emptiness influenced by 90´s English and Dutch Death/Doom with hints of Black Metal and everything in between. New album was mixed and mastered by Tore Stjerna at Necromorbus Studios (Watain, Unanimated, Desultory). Now the flames of hell will reach and burn the heavens!!! +OPHIS (Ger/Cyclone Empire) – Monolithic Doom/Death – with over 100 concerts in 20 countries including tours beside Skepticism, Ahab, Esoteric, Evoken, appearances at festivals like Party San, Hell’s Pleasure, Madrid is the Dark, Dutch Doom Days and 3 highly praised albuns, the German icon of heaviness promise for this tour a straight mixture from all their releases including exclusive previews of their upcoming forth full-lenght. +ATARAXIE (Fra/Weird Truth Prod.) – Extreme Doom/Death influenced by early 90’s Doom/Death and slowest 80’s/90’s death metal bands. Representing the French scene, Ataraxie express themselves with contrasts between ultra slow crushing parts alternate with furious blast beats, mournful parts with more epic ones, and vocals also varies from really deep grunts to tormented screams. With appearances at Danish Killtown Deathfest, Motocultor Festival, Dooom over Paris (headliner act), among many others, Ataraxie is one of the French representants of the genre. ‘Darkening your world since 2000’. Fred, guitarist of Ataraxie, adds: We have been playing many gigs this past 15 years in many countries, but we regularly receive messages from fans that would expect a gig from us in their places. We hope this tour helps us reach some long time fans that never got to see them live, aswell as playing again in places we appreciated so much. Also we’ve been working hard this past months in writing new songs, and as we love to play them live before recording them, the european metalheads can expect to taste some of our newest material every night. It’s with immense pride that Roadmaster Booking Agency has the pleasure to announce another very talented thrash metal act touring over Europe for the first time. In November/December, the American LICH KING will hit European clubs showing their thrash metal for Metalheads over Germany, Italy, The Netherlands, Spain, among many other countries. We are proud to announce that we are – in partnership with The Flaming Arts – booking the upcoming Eurotour of the most prominent extreme band to arise from Middle East, NERVECELL. 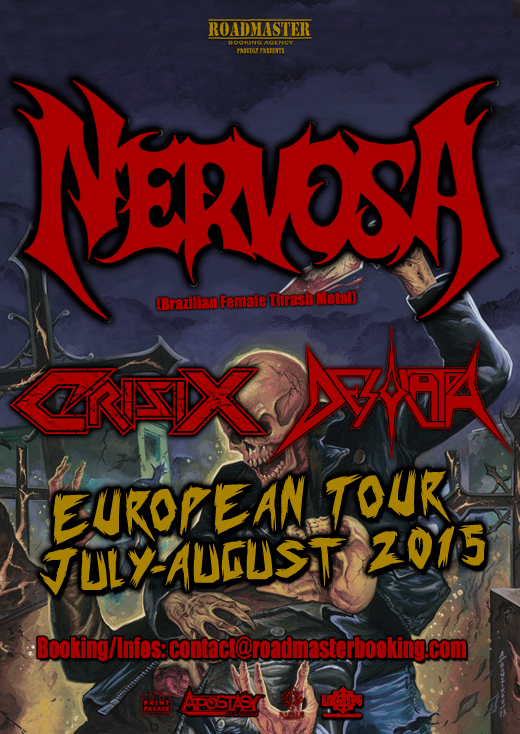 The tour will also count with the Brazilian Death Metal veterans of NERVOCHAOS. It’s with great pride that the agency Roadmaster Booking announces the first Eurotour of two of the most significant bands of Chilean extreme underground death metal scene ATOMIC AGGRESSOR and DIABOLICAL MESSIAH. The tour will happen next September 2015, and already include appearances at Germans NRW Deathfest and Italian Briscia Deathfest. It is with great pride that the agency Roadmaster Booking – in partnership with The Flaming Arts – announces the Eastern European tour of one of the greatest representatives of the Chilean Thrash Metal scene, NUCLEAR. The tour will be during August and September 2015, and will also feature the Brazilian death metal veterans of NERVOCHAOS and the Swiss thrashers of BLOODLOST.